Today this question appeared on the forums: "Easy way to give better feedback in Fluid boxes in the Quiz"
So for the second time in a couple of days a blog post based on such a question. If you missed my workflow to tweak Feedback messages for Drag&Drop, here is the link. That question is related with a blog post I have been writing about the setup of Fluid Boxes in Quizzing Master slides. 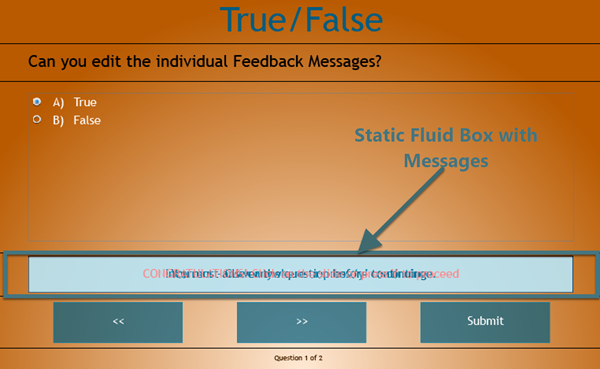 If you have read that post, it explained that all feedback messages on those master slides are stacked on top of each other, and for that reason that Fluid Box needed to be converted to a Static Fluid Box. I didn't mention in that post the workflow I am using to create individual feedback messages on the quiz slides which is the purpose of this short article. You can see it as a add-on for the article about fluid boxes in Quizzing master slides, and maybe also show some features of that static Fluid Box, which are not very well documented but which I discovered when trying to find the easiest workflow. Before starting the work flow described below, check the quizzing master slide. Make sure the used styles for the messages are correct and that all the message containers have the same size and are aligned. For the packaged themes that is not always the case. You have to know that it is NOT necessary to unlock an object from a static fluid box before moving it! That is only the case for the normal, non-static fluid boxes. In static fluid boxes the objects are not glued to the fluid box in the same level. You can even move them out of the fluid box. Remember: if you screw up something when trying out the workflow, you can always return to the normal situation by clicking the button 'Reset Master Slide' in the Properties panel of the slide. Select the top message. In the default stacking order it will be the Success message. Edit the text. If you are seeing the text of the other images below, check the opacity of the fill, and increase it. 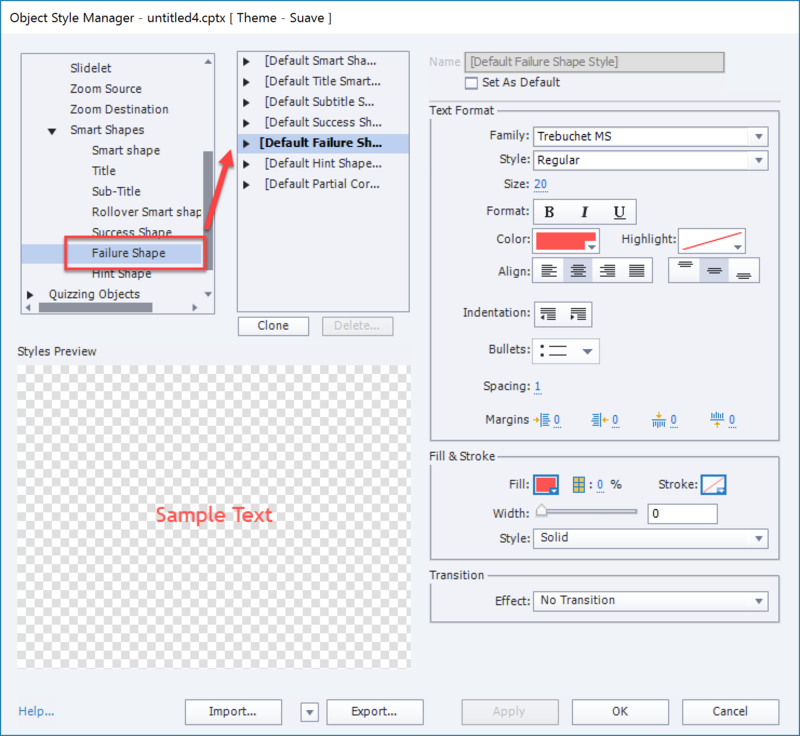 After editing keep the message selected and move it out of the way. I mostly use the shortcut key CTRL-UP in this case. With each use of that shortcut the message will move up 16px (which is the default size in the grid). 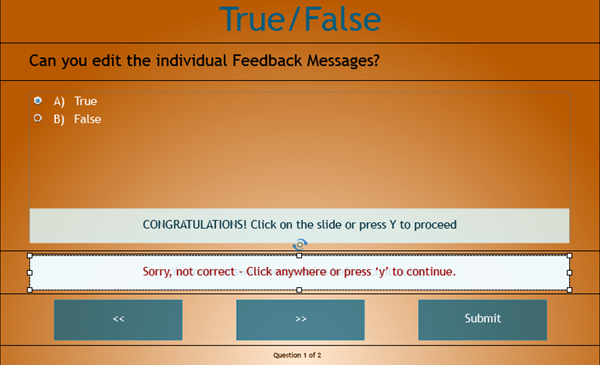 Be careful: the message will be over the fluid box containing the answer area. It will not snap to that fluid box, but you'll not be able to select it anymore. That doesn't matter. In the used theme shape for this message had an Opacity = 0. I changed it to 80% to be able to read and edit the text. No need to reset the style, will be done in the last step. Edit the next message, in default setting it will be the Incorrect message. If you have more messages, move the second message up, edit the third etc.. 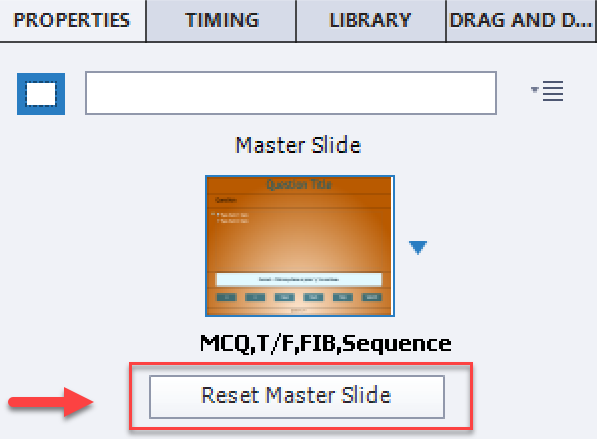 Pretty easy: reset the master slide as shown in the first screenshot. It remain a cumbersome workflow, but at least you don't have to unlock from the fluid box as many tell, nor getting them back into the fluid box. If you looked at the thread you see those unnecessary steps mentioned by the Adobe chat and another user. Probably misunderstanding the differences between static and normal fluid boxes. It is still a new workflow, Fluid Boxes, and really quite different from designing a non-responsive project or even a responsive project with Breakpoints.